Hanae Utamura, visual artist from Tokyo/Japan, met chess grandmaster Ana Matnadze at Solitude. She invited her to be part of her new work, the multi-channel video installation Across the Grid, where she was filmed playing a game – not on a grid, but on the map of a Rococo garden. Take a walk in the forest! Clara Herrmann: What role does chess, its logic and structure play in Across the Grid? How did you start collaborating with chess player Ana Matnadze? Hanae Utamura: To me, the game of chess is a meta-structure of how we think, without a specific reference, in abstract form. However, it has a strong component of hierarchy, and how power works in a diagrammatic context. The grid symbolizes social norms, or laws, that influence our behaviour throughout a network. I joined the internal presentation organized by chess fellows at Solitude, and also went to the chess tournament where Ana Matnadze played. I was struck by the intensity of the chess room, with the clock ticking, and everyone intensely, but calmly, thinking, and also the meditative atmosphere as a whole. CH: Also inspired by Schloss Solitude’s history, the match is played not on a chessboard with a grid, but on an imprint of the Rococo garden map that used to exist in the forest 250 years ago when Schloss Solitude was built. What interested you in the history of the Schloss? CH: When the garden is overgrown, the grid disappears … So the video installation builds a link between elements of the chess game and the history of Schloss Solitude; board, map, forest, the actual walk or walker. Can you explain how this concept works in between? HU: There are basically three mapped surfaces that are displacing one another throughout Across the Grid as a whole. 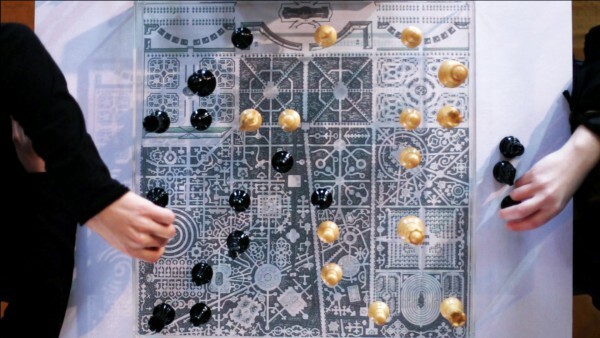 First, there is the grid of the chessboard, whose ranks and files have been substituted with a map of the original Rococo garden, over which Ana and Jens play their game. Then, there is the garden, the map of which one also finds at the entrance to the Solitude forest, but it itself has been overgrown with trees, new plant life, and displaced with roads, etc. Third, there is the audience walking in the forest and tracing the paths of three critical chess moves from the game, sometimes having to cut through dense brush as they imagine the grid over the forest. So each surface is navigated with a different surface imagined over it. CH: In the show you allow the audience to experience the chess match with different variations, following the movement of the chess pieces. The spectator can see how the chess pieces move through the garden across the invisible grid on the chessboard. Bringing this back to the invisibility of power, when the king is gone and the grid disappears, also reminded of Foucault’s concept of governmentality, which includes inner-guidance and self-discipline: You also deal with the construct of power as well as decision making … as a chess player and as an everyday human. HU: Yes … The grid can be thought of as an »invisible grid« that exists in the player’s mind, but also can be the path that we need to follow in the forest. When the participants walk in the forest as a re-enactment of the movement of the pieces in the game, there is a bit of a paradoxical turn: The grid no longer functions as a rule but becomes the force to ask you whether to go off the grid or follow the grid – one has to choose to follow the existing paths of the forest, or go into the forest growth. 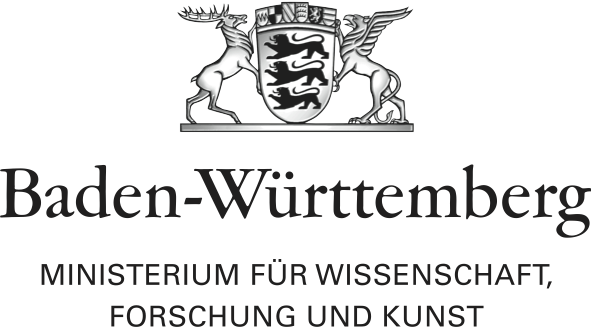 There are several paradoxes that take place in the work – for example when Steve, who works at the U.S. Army Garrison Stuttgart, explains how humans have to make a decision, like machines, in a critical moment, by calculating the risk and measuring the percentage of death/loss in an action. Conversely, chess journalist Leontxo explains how computer programs/machines mimic human beings by making a long-term risk, like a grandmaster, but without knowing the specific advantages of that risk; an uncalculated risk, merely imitating long-term, abstract human decision-making. CH: In the text of the exhibition you ask: »What is the construction of experience today and how do we form our world from images and information?« Could you shape your thoughts around this question a little? HU: To me, the computer/human dynamic in the piece describes the situation we have right now, where machines shape how we see our world through screens and images, mediating our physical experience. To me, walking in the forest is the ultimate counterpoint to watching trees through computer screens, and the work invites us to experience this physicality that we are losing nowadays. CH: Where do you locate this work in your artistic life, is there a change or even break in your work history? HU: This is my first video installation that is a non-narrative multi-channel installation – in a way the only real narrative is the 6 minutes and 17 seconds of the game itself. The multi-channel aspect allowed me to fragment the moments, generally eschewing narration, and allowing a certain open-endedness created by the walk. The idea came as an investigation of my long-term inquiry into the conditions, and somewhat mythical aspects, of performance art that exists in many variations of the documentation through text and images. So I’m grateful for the rich context/environment of Akademie Schloss Solitude that enabled me to structure the work with so many layers. The documentation video repeats the moment of the game performance over and over again in the exhibition, but I’m hoping that the audience completes the work with a unique set of his/her personal experiences through the walk in the forest.